Beaches located at the east end of DIY region. Wediombo beach is a beach-shaped bay with a wall of lush green hills. Coastal scenery is quite beautiful and very appropriate for you lovers of hiking. Wediombo camping in the coastal area is a fun activity for a peaceful environment is very supportive. Distance from downtown Yogyakarta coast approximately 80 kilometers, and can be reached by private vehicles or special vehicles. The available public transport mini-bus that takes the form of route-Wonosari Jogja. From Wonosari city, you can move on with a mini bus to and further from shore baron Baron Wediombo shoreward. However, the bus operates only on holidays. The fee of approximately IDR 2500.00 per person. 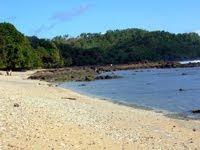 - Which extend along the white sand beach is a very comfortable place to relax. Feel the warmth of white sand beach. - The beach is also ideal for camping places, tp do not forget to keep watch for cleanliness and authenticity of this beach. - Coral reefs are huge and rugged coast is one of these privileges, but be careful when menapakinya. The slick, pointy stone will be dangerous if you do not wear gaiters.